Part of the next batch of potential soccer superstars, Eden Hazard has quickly boosted his collecting profile with strong play for Belgium and Chelsea. While card options are limited, we look at the top Eden Hazard cards to collect. Just into his mid-20s, Eden Hazard appears on track to become one of the top players in the world. Hazard began his professional career with the French Ligue 1 team, Lille OSC, at the age of 16. After emerging as one of the best young players in the league, global interest spiked for the Belgian midfielder. Chelsea ultimately won the bidding war and Eden Hazard joined The Blues in 2012. His stellar play has helped push Chelsea back to the top of the Premier League and put him on the short list of best midfielders in the world. Hazard was named the PFA Young Player of the Year in 2013-14 and the PFA Player of the Year in 2014-15. Eden Hazard also plays for the Belgium National Team and holds a prominent role with the squad. He made his first World Cup appearance in 2014, helping Belgium reach the quarterfinals. 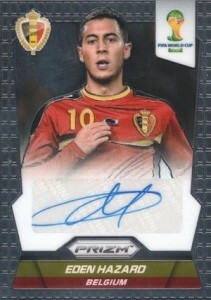 The following list includes some of the most popular Eden Hazard cards that are available now. Click on the images or listing to shop for cards on eBay. 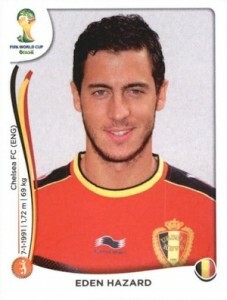 Like most global soccer players, the earliest card for Eden Hazard is a sticker. 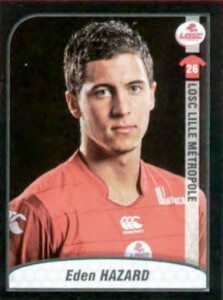 Part of the 2009-10 Panini Foot set that covers Ligue 1, the simple card showcases Hazard during his time with Lille. 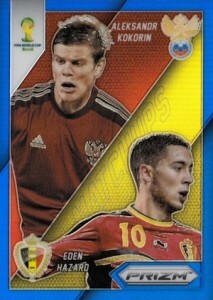 There is also a foil card for Hazard in the product. A popular premium release from Topps, Eden Hazard did not have any autographs or relics in 2013-14 Topps Premier Gold, but the various rainbow foil parallels have proven to be an appealing option. Hazard is available in the base set and the Midfield Maestros set with Green (#/99) and Orange (#/11) as the most plentiful parallels. Hazard can also be found in 2014-15 Topps Premier Gold as a member of Chelsea. 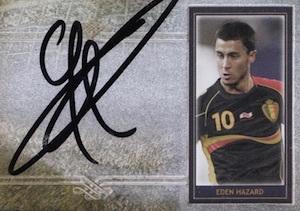 While the brand is not as established as Topps or Panini, and authenticity issues have come to light, given how few autographs are available for Eden Hazard, Futera offers collectors another option. The big draw is the on-card autograph. Several signed versions are available for Hazard in 2014 Futera World Football Unique. Offering the top overall option for Eden Hazard, collectors were treated to two signed cards in 2014 Panini Prizm World Cup. The most common is his Signatures card, which is not numbered. There is also a Prizm parallel, limited to 25 copies, which commands high values. 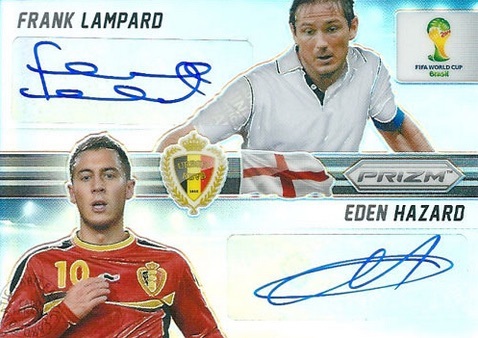 However, the most valuable Eden Hazard card is a Combo Signatures dual autograph with Frank Lampard. While the base version is numbered to ten, there is also a Prizm parallel that is numbered to ten. Another popular aspect of 2014 Prizm World Cup, the colorful Refractor-like Prizm parallels present collectors with a bunch of choices. 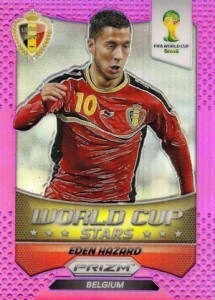 Eden Hazard is included in the base set, World Cup Stars insert and Matchups insert in a variety of colors. The 2014 World Cup marked the first appearance for Eden Hazard in the historic tournament. 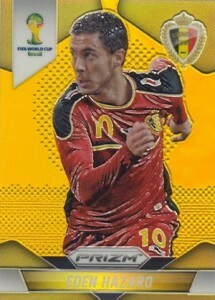 Hazard was included in the popular 2014 Panini World Cup Stickers set, which offers his most plentiful card and the easiest one to track down nearly anywhere in the world.